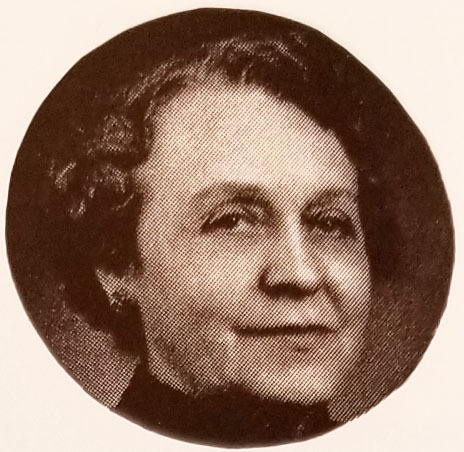 Mary Miller Brantley. Photo: The Jacob Fisher Family, 1727-1958, p.158. The Jacob Fisher Family, 1727-1958, Compiled by James L. Fisher, Arthur W. Fisher, Hilbert A. Fisher, 1958. p. 160. MARY MILLER, b. 1890, m. Rev. A. P. Brantley, D. D., Methodist Pastor and church official. Mary Miller Brantley, daughter of Elijah and Angie Houck Miller, married Rev. Allen P. Brantley, D. D., November 11, 1919. Soon after they were married, they moved to Boston, Mass. where they both continued their education in Boston and Harvard Universities.. There her husband received the following degrees. B. D., M. A., M. R. E., and S. T. M. In 1950 High Point College conferring the honorary degree of Doctor of Divinity upon him. In the summer of 1925 they toured Europe and in the fall entered Oxford University, England. In 1938 they traveled through 18 countries in Europe, Asia and Africa, during which time Dr. Brantley collected much of his material for the book he wrote the following year entitled “The Enchanted Cross.” Mary Miller Brantley and her husband have lived in North Carolina most of their lives, where Dr. Brantley is a Methodist minister and they have served many pastorates in the state and one in Kansas City, Mo. They are at present time living in Burlington, N. C. where Dr. Brantley is District Superintendent of Burlington District of the Methodist Church composed of ninety churches and forty-five pastoral charges. Mary Miller Brantley has been an active minister’s wife and has been vitally interested in all phases of her husband’s work both at the local church, as well as that of a larger area of both District and Conference level. Mary Brantley has been President of the Minister’s Wives Association of the North Carolina Conference, and is at present Chairman of the district Superintendent’s Wives Association, while her husband is President of the Bishop’s Cabinet of the North Carolina Conference. The Concord Daily Tribune, November 14, 1919, p. 7. Of Popular Young Couple – Rev. A. P. Brantley Weds Miss Mary Miller. Salisbury, N. C., R. F. D., Oct. 13. – A wedding of more than usual interest occurred Tuesday afternoon at 3:30 o’clock at the home of Mr. and Mrs. Elijah Miller, when their daughter, Mary, became the bride of Rev. A. P. Brantley. Rev. C. R. Pless and Rev. R. T. Troutman jointly officiated. The ceremony was performed in the parlor which was decorated in green and white. The alter before which the nuptial vows were taken was of ivy and potted plants over which the soft glow of numerous candles was thrown. The same color scheme prevailed in the hall, where the collection of beautiful wedding gifts was displayed, presided over by Mrs. Charlie Barrier, of Concord. Prior to the ceremony a short musical program was rendered. Miss Ruth Rudisill, of Maiden, snag “At Dawning,” by Cadman, and Mrs. Roy Kimball, of China Grove, sang “Constancy,” by Weber, with piano accompaniment. The usual wedding march pealed forth fro the deft fingers of Miss Ada Stirewalt, signalized the entrance of the bridal party. First came the dame of honor, Mrs. Lola Ewing, of Troy, followed by the groom and best man, Rev. T. H. Jenkins, of Lexington, N. C. Next came Miss Olanthe Miller, a sister o the bride, followed by a little nephew and niece, Chas. Miller Pless and Evaline Loodholdt, [sic] carrying a basket of chrysanthemums. The dame of honor wore a lovely peacock dress trimmed in georgette crepe and carried a bouquet of pink dahlias and maiden hair, while the maid of honor was beautifully dressed in a dark blue velvet with Persian trimmings and carried yellow chrysanthemums. Those charmingly dressed attendants formed a semi-circle at the foot of the altar and awaited the bride, who entered with her sister, Mrs. Albert Loudholdt, of Fairfax, S. C. The bride was very beautiful in a most becoming suit of duchess satin and cut steel buttons with accessories and hat to match and carried a bride’s corsage bouquet of rosebuds and swansouls. She was met at the altar by the groom under a beautiful arch, where they plighted their troth while the piano softly breathed rhythms of love. The beautiful marriage ceremony of the Lutheran Church was never more impressive than on this occasion. After the ceremony the bridal party was invited to the dining room, which was decorated in yellow and white, where all partook of the daintiest food of sweets. Rev. and Mrs. Brantley left on the evening train for a bridal trip to Washington and other north eastern points. Upon their return they will go to the parsonage at Glen Alpine, where they will be at home to their friends after November 21st. The bride is one of Rowan’s finest and most attractive young women and is extremely popular. She has been a teacher in the public and high schools and numbers among her friends the school patrons and children as well as the young men and women with whom she has associated since childhood. The bridegroom is one of the most promising young ministers in the Western Conference of the Methodist church and is prominently connected in social circles of several counties. Out of county guests at the wedding were: Miss Hattie Seitz, of Hickory, Miss Catherine Goodman, of Hendersonville, Miss Pearl Brantley, of Mooresville, Mrs. Sallie Goodman, of Hendersonville, Miss Ruth Rudisell, of Maiden, Mr. and Mrs. Charlie Barrier, Mrs. Smith Barrier and son, and Miss Beulah Isenhour, of Concord, Mr. Robert Brantley, of Mooresville, Dr. Albert Hauck, of Lenoir. BURLINGTON – Mrs. Mary Miller Brantley of 624 Country Club Drive died Friday in Duke Hospital, Durham, after four days of illness. She was the wife of Allen P. Brantley, D. D., a retired minister and former district superintendent of the Burlington District, United Methodist Churches. Funeral will be 3 p.m. Sunday at the Front Street United Methodist Church, of which she was a member. Entombment will be in Alamance Park Mausoleum. The body was taken to Rich & Thompson Mortuary. Mrs. Brantley was educated at Monta Amena [sic] Seminary, Lenoir-Rhyne College and Boston University. She taught in public schools in Salisbury and in Boston, Mass. Survivors are husband; daughter, Mrs. Grace Bunting of Asheboro; sister, Mrs. J. C. Rudisill Sr. of Newton. Memorial contributions may be made to the Mary Miller Brantley Scholarship at Methodist College in Fayetteville.